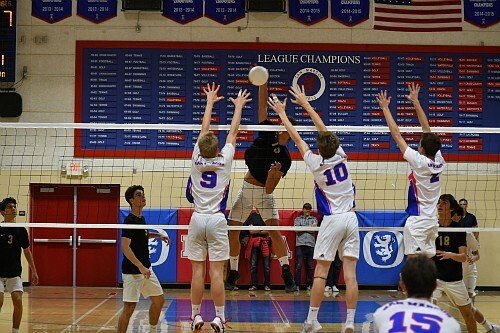 Two of the top boys volleyball teams in Southern California reside in Santa Barbara and they battled it out for Channel League supremacy on Tuesday night at Maury Halleck Gymnasium. It was Santa Barbara High that emerged victorious 29-31 25-21, 25-18, 25-19 over arch rival San Marcos behind 35 kills from senior Will Rottman. Everything did not begin smoothly for Santa Barbara as San Marcos wrestled away set one. Back-to-back kills by Brennan Ware clinched a 1-0 set lead for San Marcos after the two teams went back and forth between ties and lead changes down the stretch. Rottman was unhappy with Santa Barbara’s set one performance, but gained confidence despite the set back. In set two, San Marcos evened the scored at 20-20 on a kill by Parker Bittner, but the Dons responded with a 5-1 run capped off by a Rottman cross-court spike that evened the match at one set apiece. The Royals never recovered from the abysmal finish to set two and fell behind 17-11 in set three. A Will Pace kill cut the San Marcos deficit to 23-18 but Santa Barbara clinched a 2-1 set lead on another Rottman kill. A kill by Riley Roach clinched set four and the match for Santa Barbara. Sophomore Libero Matt Suh was a key for Santa Barbabra and finished with a match-high 16 digs. Parker Bittner finished with 14 kills on 20 swings for San Marcos. Brennan Ware chipped in 12 kills and Jacob Yinger contributed 14 digs.